Telling stories, as a way of sharing and ‘storing’ knowledge has been part of the culture of our species since we first started talking to each other. And storytelling has been recognized as a central tool in the area of work we now know as Knowledge Management in Development (KM4Dev) since Steve Denning, then leading the World Bank’s drive in the mid 1990’s to become a ‘Knowledge Bank’ made it a central part of his methodology. 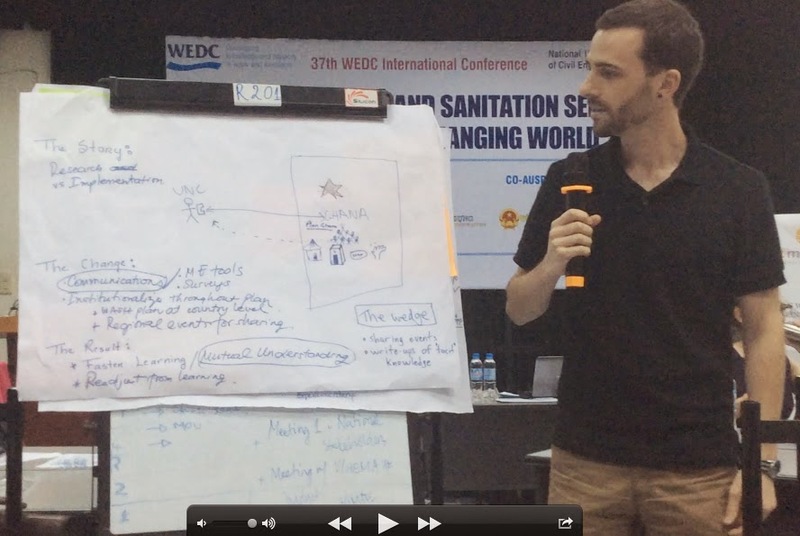 So we were following a well-trodden path in asking participants to tell a story of change at the East Meets West (EMW) workshop during the WEDC 2014 conference in Hanoi in September. What happened – list the key steps in the process? What can other people learn from your example that they could use in other situations? Share the story with another group and identify any common themes and critical factors – what had to be present for the change to happen. Was the change maintained beyond the original context – and if so what made that happen? One of the challenges of working in this way relates to the age-old tension in KM4Dev between product and process. Learning is a process, as is reflection. “Being ‘busy’ creates a mindset that is not conducive to innovation and creativity. Time to discuss, reflect and generate new ideas is the ransom that quality demands.”1. But without concrete outcomes, like reports, action points or stories – like this one – people are often uneasy about the value of these kinds of sessions. And part of the challenge is that the learning is as likely as not to become evident or relevant well after a particular workshop. We deliberately ensured that Kathryn Harries’ excellent materials were available to participants as a handout, to ensure that there was something immediately concrete to take away. And we hope to track the outcomes of the workshop with East Meets West staff in the months to come, following up on the event and asking about people’s own perception of what happened and whether useful learning took place and, most importantly, whether what happened as a result. And when we have completed this set of blogs we will follow up with other participants as well. Not everyone is a good story teller: it’s not always easy to condense important events over a period of time into a short, compelling narrative and some people are better than others at identifying the elements that will engage an audience, from amongst the detail, and even fewer people are natural raconteurs in front of an audience. The next in this series of blogs will be about the CHOBA experience in Vietnam, based on interviews with EMW staff and their key partners in the Vietnamese Women’s Union. Next Article How do we know we’re learning?